뉴올리언스, 미국의 사이트 61 호스텔 | 호스텔월드에서 예약하세요. 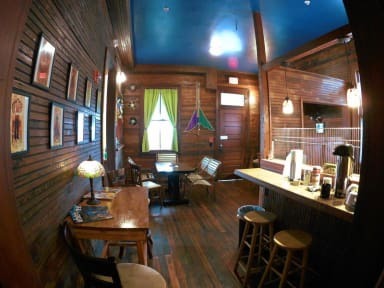 A Boutique Hostel in Mid-City, New Orleans, Site 61 Hostel is a historic early 20th century boarding house. It is now updated with modern conveniences with a Sci-Fi/Fantasy twist. We offer you a safe, friendly visit at a budget price. We offer you: Two lounges with books, games, and television, Two balconies and two porches, Kitchen warming and dining area stocked with crockpots, electric griddles, microwave, refrigerator, storage, etc., Laundry on-site, free WiFi, Front door access 24/7, Security cameras. 24 hour access to the hostel with keys/key codes but the receptionist is only there from 8am to 9pm. If people need to arrive/check in outside of those hours we can accommodate that. We just need advance warning of at least 24 hours.